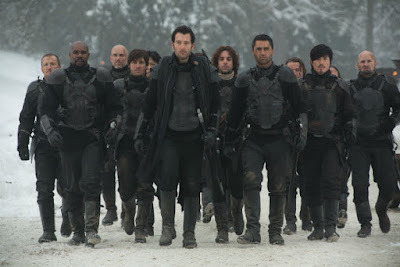 Follow the journey of brotherhood and retribution when Last Knights arrives on Blu-ray (plus Digital HD), DVD (plus Digital) and Digital HD June 30th from Lionsgate Home Entertainment. The film is currently available via On Demand. Academy Award nominee Clive Owen (Best Supporting Actor, Closer, 2004) delivers an electrifying performance as a fallen warrior who rises against a corrupt and sadistic ruler to avenge his dishonored master, Academy Award winner Morgan Freeman (Best Supporting Actor, Million Dollar Baby, 2004), in this epic, sword-clashing adventure of loyalty, honor and vengeance. Commander Raiden (Clive Owen) is an elite class of soldier with an unbreakable code of conduct. The traditions of the great knights have eroded over the years for some, but not for Raiden. He is the retainer to Lord Bartok (Morgan Freeman). Bartok is a good man who is frustrated with the corrupt minister Gezza Mot (Aksel Hennie) who reports directly to the emperor. Gezza Mot taxes the nobles and their people beyond reason and regularly accepts bribes. Others quietly pay the required tributes but Lord Bartok speaks his mind, calling them bribes and refusing to participate. Bartok is found guilty of treason and is sentenced to death. It is Mot’s suggestion that his death should come at the hand of his retainer. Raiden, of course, refuses but is told that if he does not comply, Bartok’s family, his soldiers and subjects will pay the price. Under direct order from Lord Bartok, Commander Raiden does take his life. Raiden is now a broken man, with no rank or honor who attempts to find solace at the bottom of a bottle. Concerned that Raiden will retaliate Mot has Raiden followed by the leader of his private army, Ito (Tsuyoshi Ihara). Ito appears to have more honor than Gezza Mot and he diligently follows Raiden. Ito watches Raiden drown his sorrows in alcohol, alienate his wife, and destroy his life. He reports to Mot that Raiden couldn’t possibly plan or execute any type of revenge in his condition. Mot will learn that he was right to be concerned. As I watched this film, I kept thinking about 47 Ronin, which turned out to be a much better movie. Both films are about honorable men who become outcasts. I never thought I’d prefer Keanu Reeves to Clive Owen but in this case I do. Morgan Freeman unfortunately does not live long and I can’t put my finger on why but I failed to develop any concern for Commander Raiden’s well-being. We didn’t get to know the men and their world before it was turned upside down. All the actors did a commendable job; I just have issues with where the story started. The story just missed the mark and kept me thinking of other films. Besides 47 Ronin, it made me want to watch A Knight’s Tale or even King Arthur, which also starred Clive Owen. This isn’t the type of film that turns out to be a complete waste of your time but it’s not the film you’ll want to watch a second time. 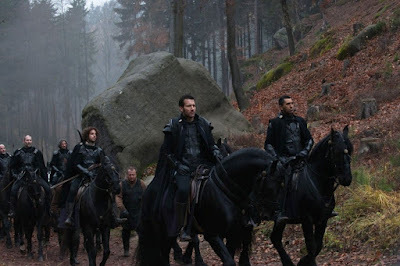 When you sit around thinking you want to see a dark medieval film, I don’t think Last Knights will come to mind. 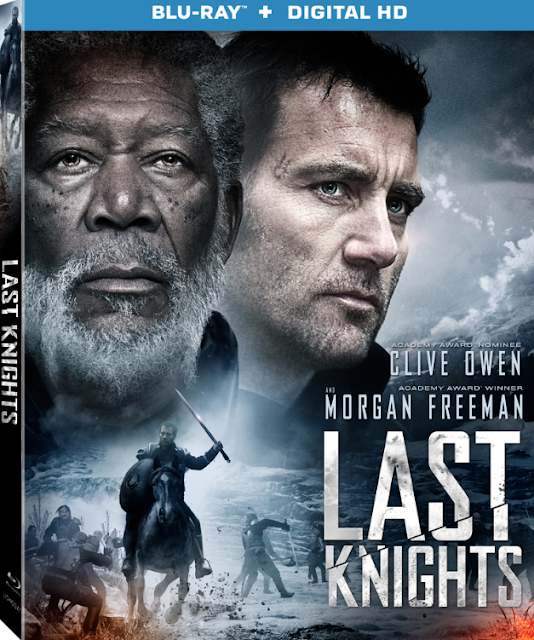 Last Knights is presented on Blu-ray, courtesy of Lionsgate with a 2.40:1 ratio. This is a very dark film and the fine detail hold up very well under those conditions. It’s a dark, depressing time and most of the film’s palette hovers around blacks and grays. Black levels suffer when the film’s natural color has obviously been stripped. The dark gritty world and cold stone walls feel authentic and true. It’s not a perfect presentation but it still well done overall. 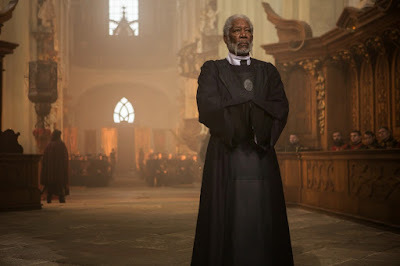 Last Knights’ DTS-HD Master Audio 5.1 track is dynamic and action packed. You can pick up the swords clanging and arrows flying like you’d expect with any decent medieval experience. With Clive Owen’s accent and manner of speaking you might miss a word or two but dialogue is generally intelligible and consistent, although they could have taken it up a notch. The score, the dialogue and the background elements work well together. 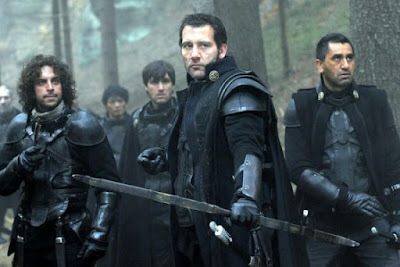 Behind The Scenes of Last Knights - (22:03) A standard featurette with cast and crew discussion about why they chose the project and what it was like shooting the action. Includes behind the scenes footage and clips from the film. A Look At The Special Effects of Last Knights - (5:04) A brief look at the special effects including pre-viz and computer generated elements. 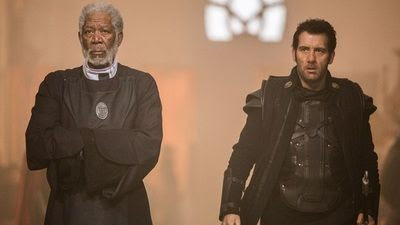 Last Knights wasn’t a bad film, but it wasn’t what I’d hoped for. The character development was lacking in the beginning and it left me wanting more. 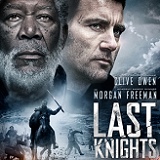 Morgan Freeman is gone too soon and this isn’t Clive Owen’s best medieval work. The emotional connections were forced and the story failed to intrigue or surprise. Fans of Owen should definitely take the time to watch, but I’d recommend against purchasing this to be part of your fantasy collection. 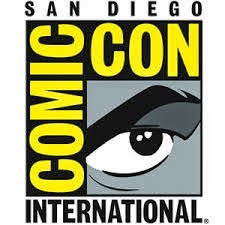 The audio and video presentation is acceptable although the list of extras is short and uneventful.